Hello, my name is Tegan James. I am extremely grateful to have the opportunity to work in an online creative environment where I can learn, communicate and network with fellow artists. The experience described by current residents sounds engaging and diverse, something I am excited to experience first-hand and become a part of. I hope this opportunity will allow me to develop my artistic skills and I am eager to begin my investigation which I hope will benefit my artistic learning as well as continue to contribute to my local and artistic community. I am keen to record my findings online as it will allow the opportunity to develop my work through an alternative therefore, accessing a wider audience. I am also interested to see the results found from the relationship of social media and my investigation and how these technologies alter and enhance any findings. As an aspiring Production Designer I have a passion for creating experiences for viewers as well as working with alternative and unique concepts. I use themes for my work as a base and often create alterative interpretations. My passion is creating statements and for my work to have multipurpose, engaging to the eye but with a political, social or historic underlying tone. My work is used to educate my viewers about a certain message as well as myself. Moving to a new environment whilst studying my foundation with ‘UWTSD’ has been beneficial and encouraging on both an educational and personal level. Thus, meaning I believe I have grown as an artist and a young adult and am hugely appreciative to have been awarded this residency enabling me to continue widening and building upon that experience. Relocating to Swansea to study for the previous academic year was stimulating as I was able to discover a wonderful city and artistic community. What the foundation has allowed me to appreciate is how to ‘open my eyes’ to everything from the smallest to the largest aspects of the environment. My concept of art has developed and matured as I have been able to approach tasks using all my senses and appreciate art is no longer confined within preconceived ideologies. I have gained the confidence to make errors but to see these as positives and learn from these and even incorporate them to improve my work. I have found there are no mistakes, these obstacles just further my awareness. Since returning to my home, within the Brecon Beacons, this experience has provided me with an altered appreciation of what I grew up amongst but did not recognise fully. I now better appreciate the diversity, community and strong opportunity for artistic and historic awareness and development. 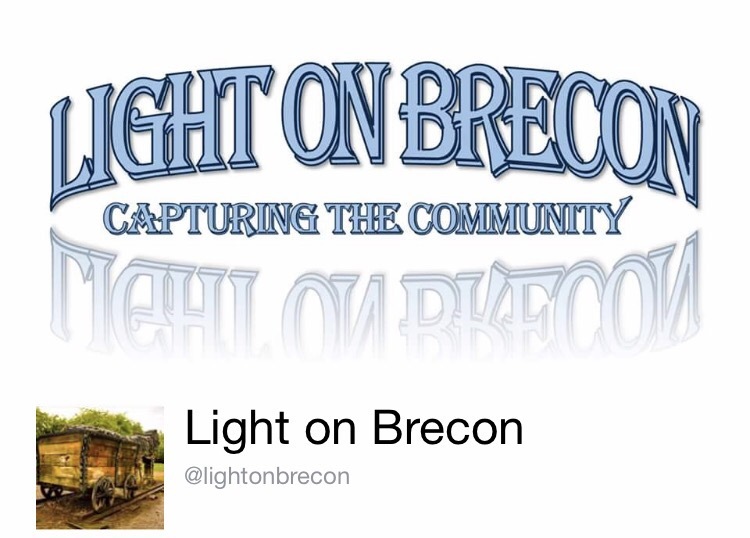 ‘Light on Brecon’ – Capturing the community! When researching initial ideas for this residency I became aware of a local project advertised through ‘F.Y.I Brecon’, which stated that the local community are running a project to encourage Breconians to engage with town activities and record these events through various mediums. 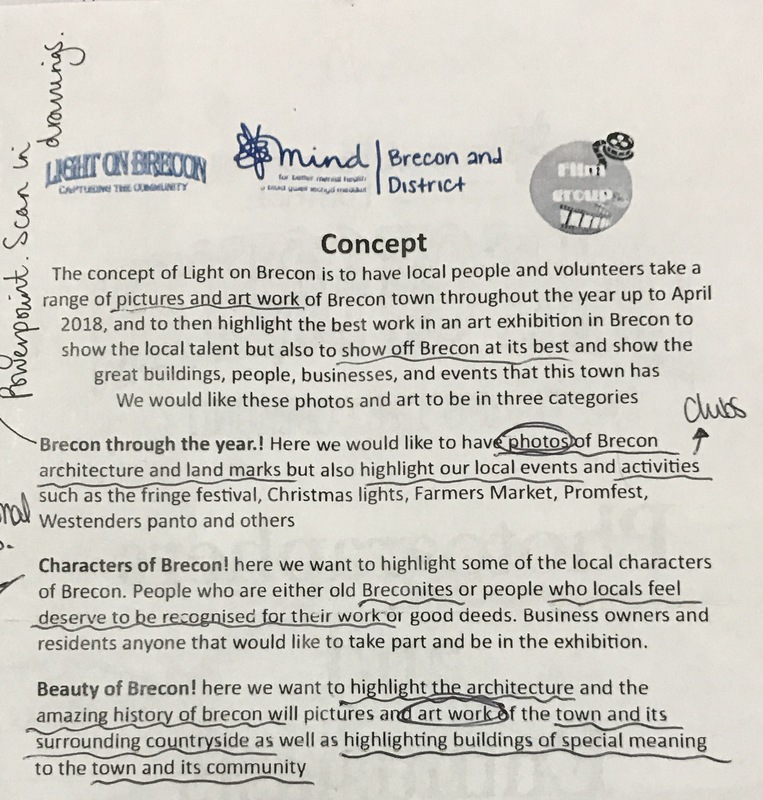 “The concept of Light on Brecon is to have local people and volunteers take a range of pictures and art work of Brecon town throughout the year up to April 2018,… to show off Brecon at its best and show the great buildings, people, businesses, and events that this town has” (Sourced from advertisement flyer). As explained above I have become more appreciative of my surroundings and this project I believe will provide an opportunity for me to discover more about my town using an artistic approach. I will be loosely following these three themes to capture the spirit of Brecon whilst also educating myself and hopefully any viewers in local history and the area. To investigate into the town history and community through research and local resources (e.g. museums, library and people) in order to extend my knowledge and to seek inspiration through my findings. 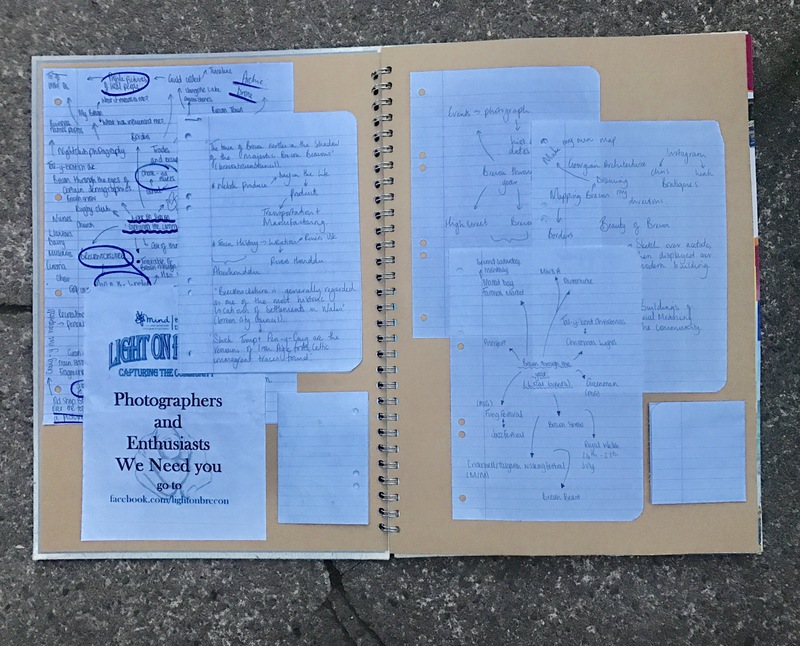 To experience the town through the eyes of another citizen – what does Brecon mean to others? – ‘A Day in the life? … Social Art. Learn how the town could improve and develop. Showcase what the area has to offer. Capture Reality – Heavily influenced by old photos of pastimes (By attempting to experience and get involved with all town events). Encourage all demographics to engage with my project and create artworks incorporating Breconians – capturing reality and encouraging art participation within the town. Work with various mediums, especially photography and social media (as an educating tool, advertisement which can reach wider demographic). Create work which has the potential to encourage tourism. Incorporate local community groups and artists. Begin by experimenting with various ideas in order to help develop my works purpose. I hope this opportunity pursuing further creativity, through this digital experience, will allow me further opportunity to use the skills I will discover to enhance my independent learning which I will be able to incorporate in my next educational venture.